The Objectives of the New International Economic Order focuses on the role of the New International Economic Order (NIEO) in the resolution of issues in world economy, international trade, economic policies, trade relations, and business practices. The manuscript first offers information on the objectives of the NIEO in historical and global perspectives, as well as the political relevance of the NIEO, historical factors in the emergence of the NIEO, and contrary perceptions and vicious circles. 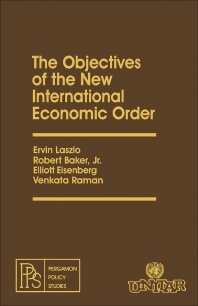 The book also takes a look at the objectives of the NIEO regarding issues in world economy. Concerns include renegotiating the debts of developing countries, attaining United Nations development assistance targets, and using funds from disarmament for development. The publication discusses international trade and world economy issues. Topics include adjusting the economic policies of developed countries to facilitate the expansion and diversification of the exports of developing countries; improving and intensifying trade relations between countries having different social and economic systems; and increasing the transfer of resources through the World Bank and the International Monetary Fund. The text also elaborates on industrialization issues, technology transfer, and business practices and social issues. The book is a vital source of information for readers interested in the role of NIEO in the resolution of issues in world economy, international trade, economic policies, trade relations, and business practices.